“Just wow” said the CBC of Alan Xu Kun Liu in naming him to their 2016 list of 30 Hot Canadian Classical Musicians Under 30. Born in Xi’An, China in December of 2001, Alan began studying piano and guitar at the age of five. When he was seven he won his first national-class prize for guitar in Beijing and has since amassed an impressive list of top prizes in music competitions around the world. He began his guitar studies with Ping Jin and Xia Yang and has performed in numerous master classes. Alan currently studies with Michael Partington of the University of Washington and Daniel Bolshoy of the Vancouver Symphony School of Music. He was the first prizewinner of the Canadian National Music Competition (2016), the GFA International Youth Competition Junior Division (2014), Guitare Montreal International Youth Competition (2014) and the Northwest Guitar Festival Adult Competition (2015). 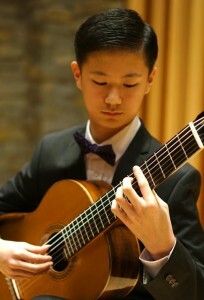 He was also a finalist and prizewinner at the Michele Pittaluga International Youth Guitar Competition in Alessandria, Italy (2014), the Parkening International Young Guitarist Competition (2015) and the GFA International Youth Competition, Senior Division (2016), as well as many other local and regional events.Alan has performed in Canada, the US and China, including a concerto with the Vancouver Symphony in 2015 and as a featured artist in the 2015 Montreal International Guitar Festival.